Maritime Southeast Asia, comprising Philippines, East Malaysia, East Timor, Indonesia, Brunei, and Singapore. The major religions are Islam, and Buddhism, followed by Christianity. However, a wide variety of religions are found throughout the region, including Hinduism and many animist-influenced practices. 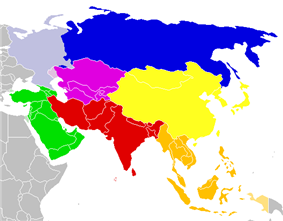 Definitions of "Southeast Asia" vary, but most definitions include the area represented by the countries and territories listed below. All of the countries excluding East Timor are members of the Association of Southeast Asian Nations (ASEAN). The area, together with part of South Asia, was widely known as the East Indies or simply the Indies until the 20th century. Christmas Island and the Cocos (Keeling) Islands are considered part of Southeast Asia though they are governed by Australia. Sovereignty issues exist over some islands in the South China Sea. Papua New Guinea has stated that it might join ASEAN, and is currently an observer. Orographic map of Southeast Asian nations. Southeast Asia is geographically divided into two subregions, namely Mainland Southeast Asia (or Indochina) and Maritime Southeast Asia (or the similarly defined Malay Archipelago) (Indonesian: Nusantara). The Andaman and Nicobar Islands of India are geographically considered part of Southeast Asia. The rest of New Guinea is sometimes included; so are Palau, Guam, and the Northern Mariana Islands, which were all part of the Spanish East Indies. The eastern half of Indonesia and East Timor (east of the Wallace Line) are considered to be biogeographically part of Oceania. A golden vestment similar to those worn by the Hindu Brahmin Caste, found in Butuan (Philippines) Archeological Digs. This artefact shows the influence of Indian culture in Southeast Asia, also through trade. Homo sapiens reached the region by around 45,000 years ago, having moved eastwards from the Indian subcontinent. Homo floresiensis also lived in the area up until 12,000 years ago, when they became extinct. Austronesian people, who form the majority of the modern population in Indonesia, Malaysia, Brunei, East Timor, and the Philippines, may have migrated to Southeast Asia from Taiwan. They arrived in Indonesia around 2000 BC,and as they spread through the archipelago, they often settled along coastal areas and confined indigenous peoples such as Negritos of the Philippines or Papuans of New Guinea to inland regions. Studies presented by HUGO (Human Genome Organisation) through genetic studies of the Asian races, scientifically points out to another Asian migration from Southeast Asia travelling northwards slowly populating southern parts of East Asia and then East Asia itself instead of the other way around. Solheim and others have shown evidence for a Nusantao (Nusantara) maritime trading network ranging from Vietnam to the rest of the archipelago as early as 5000 BC to 1 AD. The peoples of Southeast Asia, especially those of Austronesian descent, have been seafarers for thousands of years, some reaching the island of Madagascar. Their vessels, such as the vinta, were ocean-worthy. Magellan's voyage records how much more manoeuvrable their vessels were, as compared to the European ships. Passage through the Indian Ocean aided the colonisation of Madagascar by the Austronesian people, as well as commerce between West Asia and Southeast Asia. Gold from Sumatra is thought to have reached as far west as Rome, while a slave from the Sulu Sea was believed to have been used in Magellan's voyage as a translator. Originally most people were animist. This was later replaced by Hinduism. Theravada Buddhism soon followed in 525. In the 15th century, Islamic influences began to enter. This forced the last Hindu court in Indonesia to retreat to Bali. In Mainland Southeast Asia, Burma, Cambodia and Thailand retained the Theravada form of Buddhism, brought to them from Sri Lanka. This type of Buddhism was fused with the Hindu-influenced Khmer culture. Very little is known about Southeast Asian religious beliefs and practices before the advent of Indian merchants and religious influences from the 2nd century BCE onwards. Prior to the 13th century CE, Hinduism and Buddhism were the main religions in Southeast Asia. The Jawa Dwipa Hindu kingdom in Java and Sumatra existed around 200 BCE. The history of the Malay-speaking world began with the advent of Indian influence, which dates back to at least the 3rd century BCE. Indian traders came to the archipelago both for its abundant forest and maritime products and to trade with merchants from China, who also discovered the Malay world at an early date. Both Hinduism and Buddhism were well established in the Malay Peninsula by the beginning of the 1st century CE, and from there spread across the archipelago. Cambodia was first influenced by Hinduism during the beginning of the Funan kingdom. Hinduism was one of the Khmer Empire's official religions. Cambodia is the home to one of the only two temples dedicated to Brahma in the world. 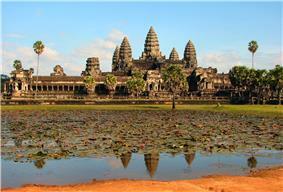 Angkor Wat is also a famous Hindu temple of Cambodia. The Champa civilisation was located in what is today central Vietnam, and was a highly Indianised Hindu Kingdom. The Vietnamese committed genocide against the Cham people during the 1471 Vietnamese invasion of Champa, ransacking and burning Champa, slaughtering thousands of Cham people, and forcibly assimilating them into Vietnamese culture. The Majapahit Empire was an Indianised kingdom based in eastern Java from 1293 to around 1500. Its greatest ruler was Hayam Wuruk, whose reign from 1350 to 1389 marked the empire's peak when it dominated other kingdoms in the southern Malay Peninsula, Borneo, Sumatra, and Bali. Various sources such as the Nagarakertagama also mention that its influence spanned over parts of Sulawesi, Maluku, and some areas of western New Guinea and the Philippines, making it the largest empire to ever exist in Southeast Asian history. The Cholas excelled in maritime activity in both military and the mercantile fields. Their raids of Kedah and the Srivijaya, and their continued commercial contacts with the Chinese Empire, enabled them to influence the local cultures. Many of the surviving examples of the Hindu cultural influence found today throughout Southeast Asia are the result of the Chola expeditions. 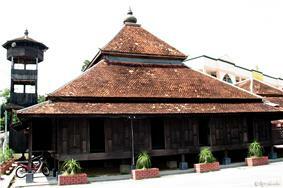 Kampung Laut Mosque in Tumpat is one of the oldest mosques in Malaysia, dating to early 18th century. In the 11th century, a turbulent period occurred in the history of Maritime Southeast Asia. The Indian Chola navy crossed the ocean and attacked the Srivijaya kingdom of Sangrama Vijayatungavarman in Kadaram (Kedah), the capital of the powerful maritime kingdom was sacked and the king was taken captive. Along with Kadaram, Pannai in present day Sumatra and Malaiyur and the Malayan peninsula were attacked too. Soon after that, the king of Kedah Phra Ong Mahawangsa became the first ruler to abandon the traditional Hindu faith, and converted to Islam with the Sultanate of Kedah established in year 1136. Samudera Pasai converted to Islam in the year 1267, the King of Malacca Parameswara married the princess of Pasai, and the son became the first sultan of Malacca. Soon, Malacca became the center of Islamic study and maritime trade, and other rulers followed suit. Indonesian religious leader and Islamic scholar Hamka (1908–1981) wrote in 1961: "The development of Islam in Indonesia and Malaya is intimately related to a Chinese Muslim, Admiral Zheng He." Children studying Koran in Java during colonial period. There are several theories to the Islamisation process in Southeast Asia. Another theory is trade. The expansion of trade among West Asia, India and Southeast Asia helped the spread of the religion as Muslim traders from Southern Yemen (Hadramout) brought Islam to the region with their large volume of trade. Many settled in Indonesia, Singapore, and Malaysia. This is evident in the Arab-Indonesian, Arab-Singaporean, and Arab-Malay populations who were at one time very prominent in each of their countries. The second theory is the role of missionaries or Sufis. The Sufi missionaries played a significant role in spreading the faith by introducing Islamic ideas to the region. Finally, the ruling classes embraced Islam and that further aided the permeation of the religion throughout the region. The ruler of the region's most important port, Malacca Sultanate, embraced Islam in the 15th century, heralding a period of accelerated conversion of Islam throughout the region as Islam provided a positive discriminatory force among the ruling and trading classes. Records from Magellan's voyage show that Brunei possessed more cannon than the European ships, so the Chinese must have been trading with them. From 111 BC to 938 AD Vietnam was under Chinese rule. Vietnam was successfully governed by a series of Chinese dynasties including the Han, Eastern Han, Eastern Wu, Cao Wei, Jin, Liu Song, Southern Qi, Liang, Sui, Tang, and Southern Han. Western influence started to enter in the 16th century, with the arrival of the Portuguese and Spanish in Maluku and the Philippines. Later the Dutch established the Dutch East Indies; the French Indochina; and the British Strait Settlements. Later, all Southeast Asian countries were colonised except for Thailand. European explorers were reaching Southeast Asia from the west and from the east. Regular trade between the ships sailing east from the Indian Ocean and south from mainland Asia provided goods in return for natural products, such as honey and hornbill beaks from the islands of the archipelago. Conflicting claims over the Spratly Islands are made by Brunei, China, Malaysia, Philippines, Taiwan, and Vietnam. The second tallest peak in Southeast Asia, Mount Kinabalu in Malaysia. 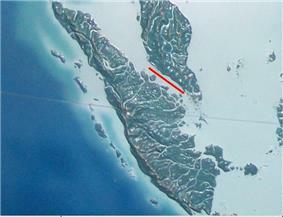 Geologically, the Malay archipelago is one of the most volcanically active regions in the world. Geological uplifts in the region have also produced some impressive mountains, culminating in Puncak Jaya in Papua, Indonesia at 5,030 metres (16,500 feet), on the island of New Guinea; it is the only place where ice glaciers can be found in Southeast Asia. The second tallest peak is Mount Kinabalu in Sabah, Malaysia on the island of Borneo with a height of 4,095 metres (13,435 feet). The highest mountain in Southeast Asia is Hkakabo Razi at 5,967 meters and can be found in northern Burma sharing the same range of its parent peak, Mount Everest. The largest archipelago in the world by size is Indonesia (according to the CIA World Factbook). The climate in Southeast Asia is mainly tropical–hot and humid all year round with plentiful rainfall. Northern Vietnam and the Myanmar Himalayas are the only regions in Southeast Asia that features a subtropical climate, which has a cold winter with snow. 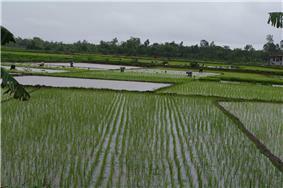 Majority of Southeast Asia has a wet and dry season caused by seasonal shift in winds or monsoon. The tropical rain belt causes additional rainfall during the monsoon season. The rain forest is the second largest on earth (with the Amazon being the largest). An exception to this type of climate and vegetation is the mountain areas in the northern region, where high altitudes lead to milder temperatures and drier landscape. Other parts fall out of this climate because they are desert like. The Malay Archipelago is split by the Wallace Line. This line runs along what is now known to be a tectonic plate boundary, and separates Asian (Western) species from Australasian (Eastern) species. 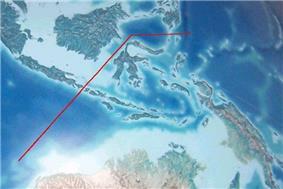 The islands between Java/Borneo and Papua form a mixed zone, where both types occur, known as Wallacea. As the pace of development accelerates and populations continue to expand in Southeast Asia, concern has increased regarding the impact of human activity on the region's environment. 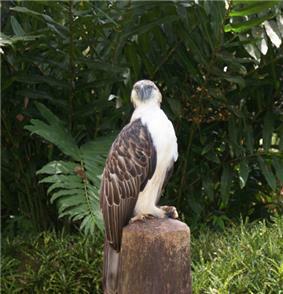 A significant portion of Southeast Asia, however, has not changed greatly and remains an unaltered home to wildlife. The nations of the region, with only few exceptions, have become aware of the need to maintain forest cover not only to prevent soil erosion but to preserve the diversity of flora and fauna. 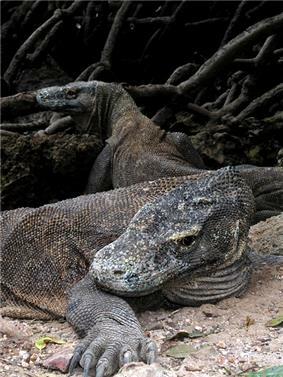 Indonesia, for example, has created an extensive system of national parks and preserves for this purpose. Even so, such species as the Javan rhinoceros face extinction, with only a handful of the animals remaining in western Java. The shallow waters of the Southeast Asian coral reefs have the highest levels of biodiversity for the world's marine ecosystems, where coral, fish and molluscs abound. According to Conservation International, marine surveys suggest that the marine life diversity in the Raja Ampat area is the highest recorded on Earth. Diversity is considerably greater than any other area sampled in the Coral Triangle composed of Indonesia, Philippines, and Papua New Guinea. The Coral Triangle is the heart of the world's coral reef biodiversity, making Raja Ampat quite possibly the richest coral reef ecosystems in the world. The whale shark, the world's largest species of fish and 6 species of sea turtles can also be found in the South China Sea and the Pacific Ocean territories of the Philippines. While Southeast Asia is rich in flora and fauna, Southeast Asia is facing severe deforestation which causes habitat loss for various endangered species such as orangutan and the Sumatran tiger. Predictions have been made that more than 40% of the animal and plant species in Southeast Asia could be wiped out in the 21st century. At the same time, haze has been a regular occurrence. The two worst regional hazes were in 1997 and 2006 in which multiple countries were covered with thick haze, mostly caused by "slash and burn" activities in Indonesia. In reaction, several countries in Southeast Asia signed the ASEAN Agreement on Transboundary Haze Pollution to combat haze pollution. Even prior to the penetration of European interests, Southeast Asia was a critical part of the world trading system. A wide range of commodities originated in the region, but especially important were spices such as pepper, ginger, cloves, and nutmeg. The spice trade initially was developed by Indian and Arab merchants, but it also brought Europeans to the region. First Spaniards (Manila galleon) and Portuguese, then the Dutch, and finally the British and French became involved in this enterprise in various countries. The penetration of European commercial interests gradually evolved into annexation of territories, as traders lobbied for an extension of control to protect and expand their activities. As a result, the Dutch moved into Indonesia, the British into Malaya, the French into Indochina, and the Spanish and the US into the Philippines. Seventeen telecommunications companies contracted to build the Asia-America Gateway submarine cable to connect Southeast Asia to the US This is to avoid disruption of the kind recently caused by the cutting of the undersea cable from Taiwan to the US in the 2006 Hengchun earthquake. Tourism has been a key factor in economic development for many Southeast Asian countries, especially Cambodia. According to UNESCO, “tourism, if correctly conceived, can be a tremendous development tool and an effective means of preserving the cultural diversity of our planet.” Since the early 1990s, “even the non-ASEAN nations such as Cambodia, Laos, Vietnam and Burma, where the income derived from tourism is low, are attempting to expand their own tourism industries.” In 1995, Singapore was the regional leader in tourism receipts relative to GDP at over 8%. By 1998, those receipts had dropped to less than 6% of GDP while Thailand and Lao PDR increased receipts to over 7%. Since 2000, Cambodia has surpassed all other ASEAN countries and generated almost 15% of its GDP from tourism in 2006. 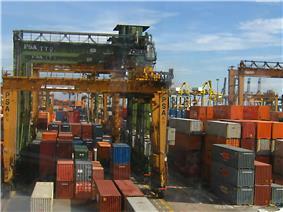 Indonesia is the only member of G-20 major economies and is the largest economy in the region. Indonesia's estimated gross domestic product (nominal) for 2008 was US$511.7 billion with estimated nominal per capita GDP was US$2,246, and per capita GDP PPP was US$3,979 (international dollars). Southeast Asia has an area of approximately 4,000,000 km2 (1.6 million square miles). As of 2007, more than 593 million people lived in the region, more than a fifth of them (125 million) on the Indonesian island of Java, the most densely populated large island in the world. Indonesia is the most populous country with 230 million people and also the 4th most populous country in the world. The distribution of the religions and people is diverse in Southeast Asia and varies by country. Some 30 million overseas Chinese also live in Southeast Asia, most prominently in Christmas Island, Malaysia, Philippines, Singapore, Indonesia and Thailand, and also, as the Hoa, in Vietnam. In modern times, the Javanese are the largest ethnic group in Southeast Asia, with more than 86 million people, mostly concentrated in Java, Indonesia. In Burma, the Burmese account for more than two-thirds of the ethnic stock in this country, while ethnic Thais and Vietnamese account for about four-fifths of the respective populations of those countries. Indonesia is clearly dominated by the Javanese and Sundanese ethnic groups, while Malaysia is split between half Malays and one-quarter Chinese. 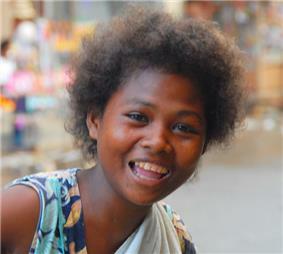 Within the Philippines, the Tagalog, Cebuano, Ilocano, and Hiligaynon groups are significant. Islam is the most widely practised religion in Southeast Asia, numbering approximately 240 million adherents which translate to about 40% of the entire population, with majorities in Brunei, Indonesia, Malaysia and in Southern Philippines. Countries in Southeast Asia practice many different religions. 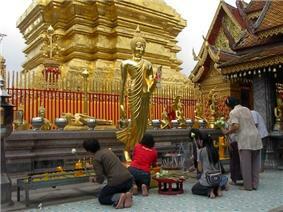 Buddhism is predominant in Thailand, Cambodia, Laos, Burma, Vietnam and Singapore. Ancestor worship and Confucianism are also widely practised in Vietnam and Singapore. Christianity is predominant in the Philippines, eastern Indonesia, East Malaysia and East Timor. The Philippines has the largest Roman Catholic population in Asia. East Timor is also predominantly Roman Catholic due to a history of Portuguese rule. 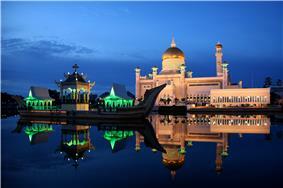 Sultan Omar Ali Saifuddin Mosque in Brunei, an Islamic country with strict Syariah rule. Religions and peoples are diverse in Southeast Asia and not one country is homogeneous. In the world's most populous Muslim nation, Indonesia, Hinduism is dominant on islands such as Bali. Christianity also predominates in Philippines, New Guinea and Timor. Pockets of Hindu population can also be found around Southeast Asia in Singapore, Malaysia etc. Garuda (Sanskrit: Garuḍa), the phoenix who is the mount (vahanam) of Vishnu, is a national symbol in both Thailand and Indonesia; in the Philippines, gold images of Garuda have been found on Palawan; gold images of other Hindu gods and goddesses have also been found on Mindanao. Balinese Hinduism is somewhat different from Hinduism practised elsewhere, as Animism and local culture is incorporated into it. Christians can also be found throughout Southeast Asia; they are in the majority in East Timor and the Philippines, Asia's largest Christian nation. In addition, there are also older tribal religious practices in remote areas of Sarawak in East Malaysia,Highland Philippines and Papua in eastern Indonesia. In Burma, Sakka (Indra) is revered as a nat. In Vietnam, Mahayana Buddhism is practised, which is influenced by native animism but with strong emphasis on Ancestor Worship. Each of the languages have been influenced by cultural pressures due to trade, immigration, and historical colonisation as well. The culture in Southeast Asia is very diverse: on mainland Southeast Asia, the culture is a real mix of Indian (Burma, Cambodia, Laos, Malaysia and Thailand) and Chinese (Vietnam and Singapore). While in Indonesia, the Philippines, Malaysia and Singapore, the culture is a mix of Chinese, Indian, Western and the indigenous Austronesian culture. Also Brunei shows a strong influence from Arabia. Vietnam and Singapore show more Chinese influence in that Vietnam was in China's sphere of influence for much of its history and Singapore, although being a Southeast Asian nation, is home to a large Chinese majority. Indian influence in Singapore is only evident through the Tamil migrants, which influenced, to some extent, the cuisine of Singapore. Throughout Vietnam's history, it has had no direct influence from India - only through contact with the Thai, Khmer and Cham peoples. Stilt houses can be found all over Southeast Asia, from Thailand and Laos, to Borneo, to Luzon in the Philippines, to Papua New Guinea. The region has diverse metalworking, especially in Indonesia. This include weaponry, such as the distinctive kris, and musical instruments, such as the gamelan. The region's chief cultural influences have been from either China or India or both. Diverse culture influence is most pronounced in the Philippines, derived particularly from the period of the Spanish and American rule and the Chinese trading era. The Filipinos have a majority of Indian, Malay, and Chinese blood. As a rule, the peoples who ate with their fingers were more likely influenced by the culture of India, for example, than the culture of China, where the peoples first ate with chopsticks; tea, as a beverage, can be found across the region. The fish sauces distinctive to the region tend to vary. The arts of Southeast Asia have no affinity with the arts of other areas. Dance in much of Southeast Asia also includes movement of the hands as well as the feet, to express the dance's emotion and meaning of the story that the ballerina is going to tell the audience. Most of Southeast Asian introduced dance into their court; in particular, Cambodian royal ballet represented them in the early 7th century before the Khmer Empire, which was highly influenced by Indian Hinduism. Apsara Dance, famous for strong hand and feet movement, is a great example of Hindu symbolic dance. Puppetry and shadow plays were also a favoured form of entertainment in past centuries as the famous one known as Wayang from Indonesia. The arts and literature in some of Southeast Asia is quite influenced by Hinduism brought to them centuries ago. The Tai, coming late into Southeast Asia, brought with them some Chinese artistic traditions, but they soon shed them in favour of the Khmer and Mon traditions, and the only indications of their earlier contact with Chinese arts were in the style of their temples, especially the tapering roof, and in their lacquerware. Indonesia, despite conversion to Islam which opposes certain forms of art, has retained many forms of Hindu-influenced practices, culture, art and literature. An example is the *Wayang Kulit (Shadow Puppet) and literature like the Ramayana. This is also true for mainland Southeast Asia (excluding Vietnam). Dance movements, Hindu gods, and arts were also fused into Thai, Khmer, Lao and Burmese cultures. It has been pointed out that Khmer and Indonesian classical arts were concerned with depicting the life of the gods, but to the Southeast Asian mind the life of the gods was the life of the peoples themselves—joyous, earthy, yet divine. 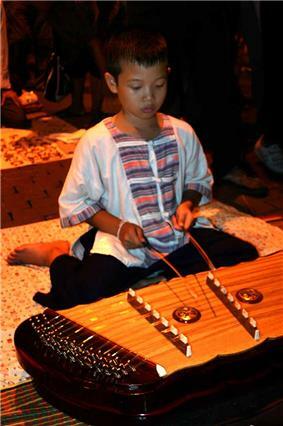 A Thai boy plays the khim, a traditional Thai instrument similar to the yangqin from China. Of the court and folk genres, gong-chime ensembles and orchestras make up the majority (the exception being lowland areas of Vietnam). Gamelan orchestras from Indonesia, Piphat /Pinpeat ensembles of Thailand and Cambodia and the Kulintang ensembles of the southern Philippines, Borneo, Sulawesi and Timor are the three main distinct styles of musical genres that have influenced other traditional musical styles in the region. String instruments also are popular in the region. The Terengganu Inscription Stone in Malaysia, written in year 1303. 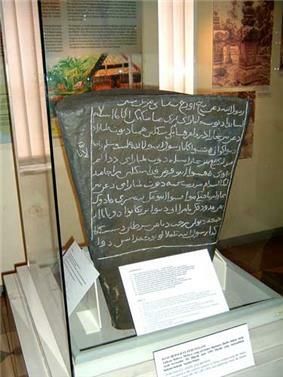 It is the oldest written artefact with Jawi script on it. ^ Klaus Kästle (10 September 2013). "Map of Southeast Asia Region". Nations Online Project. One World - Nations Online. Retrieved 10 September 2013. Nations Online is an online destination guide with many aspects of the nations and cultures of the world: geography, economy, science, people, culture, environment, travel and tourism, government and history. ^ "World Macro Regions and Components". The United Nations. Retrieved 13 September 2009. ^ The modern anthropology of South ... .Google Books. Retrieved on 17 October 2011. ^ Papua New Guinea asks RP support for Asean membership bid. Retrieved 8 July 2009. ^ Somare seeks PGMA's support for PNG's ASEAN membership bid. Retrieved 8 July 2009. ^ a b c d . IMF GDP http://www.imf.org/external/pubs/ft/weo/2012/02/weodata/weorept.aspx?sy=2014&ey=2017&scsm=1&ssd=1&sort=country&ds=.&br=1&pr1.x=50&pr1.y=17&c=548%2C518%2C516%2C522%2C566%2C576%2C578%2C537%2C536%2C582%2C544&s=NGDPD%2CNGDPDPC%2CLP&grp=0&a=title=SEA GDP. ^ Population census data as per the Indian Census. ^ Demeter F, et al. (2012) Anatomically modern human in Southeast Asia (Laos) by 46 ka. Proc Natl Acad Sci USA 109(36):14375–14380. ^ Smithsonian (July 2008). "The Great Human Migration". p. 2. ^ Morwood, M. J.; Brown, P., Jatmiko, Sutikna, T., Wahyu Saptomo, E., Westaway, K. E., Rokus Awe Due, Roberts, R. G., Maeda, T., Wasisto, S. and Djubiantono, T. (13 October 2005). "Further evidence for small-bodied hominins from the Late Pleistocene of Flores, Indonesia". ^ Taylor, Jean Gelman (2003). Indonesia: Peoples and Histories. New Haven and London: Yale University Press. pp. 5–7. ^ Ben Kiernan (2009). Blood and Soil: A World History of Genocide and Extermination from Sparta to Darfur. Yale University Press. p. 110. ^ a b Murray L Weidenbaum (1 January 1996). The Bamboo Network: How Expatriate Chinese Entrepreneurs are Creating a New Economic Superpower in Asia. Martin Kessler Books, Free Press. pp. 4–8. ^ Murray L Weidenbaum (1 January 1996). The Bamboo Network: How Expatriate Chinese Entrepreneurs are Creating a New Economic Superpower in Asia. Martin Kessler Books, Free Press. pp. 23–28. ^ Background overview of The National Seminar on Sustainable Tourism Resource Management, Phnom Penh, 9–10 June 2003. ^ What is the G-20, www.g20.org. Retrieved 6 October 2009. ^ "Report for Selected Countries and Subjects". Imf.org. 14 September 2006. Retrieved 28 April 2010. ^ Bull Market Lifts PSE Index to Top Rank Among Stock Exchanges in Asia | The Manila Bulletin Newspaper Online. Mb.com.ph (24 September 2010). Retrieved on 17 October 2011. ^ "The 2009 Vietnam Population and Housing Census: Completed Results". General Statistics Office of Vietnam: Central Population and Housing Census Steering Committee. June 2010. p. 281. Retrieved 1 September 2012. Rand, Nelson (2009). Conflict: Journeys through war and terror in SouthEast Asia. Dunboyne: Maverick House Publishers.